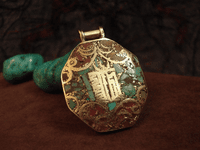 Handmade Tibetan Pendant - Klachakra, Turquoise and Coral. Handmade Tibetan Pendant - Klachakra, Turquoise and Coral. It was handmade in Tibet from copper, red coral and turquoise. Size:3.5*3.0 cm .